I am not the type of man who reads about military technology, Soldiers of Fortune magazine or wears camouflage clothing. And I never forget that like a gun, instruments of war are just that. I think many men frequently look at weaponry divorced from their real function, which should be understood and respected. Armed forces should be honored, but weaponry should not be glamorized. That said, military technology is impressive. Virtually unlimited sums of money are available to develop extremely sophisticated weaponry, ships, aircraft, vehicles and support systems. Costs play a much smaller role - expense never has to be justified as it would in a business venture. 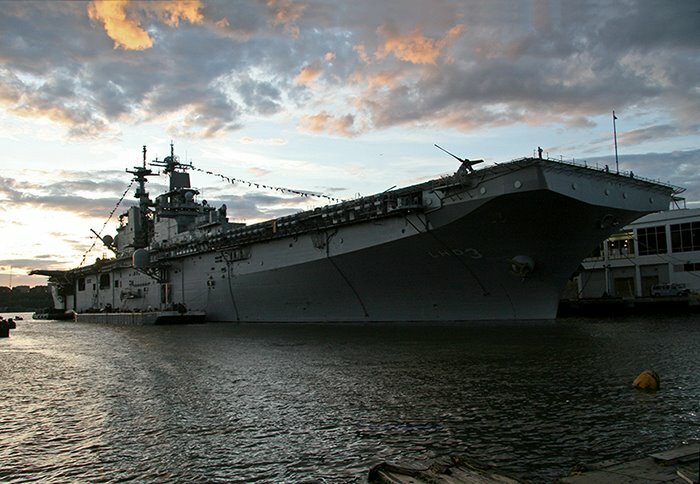 The ship in the photo, shot at sunset on the pier at west 48th street, is the USS Kearsarge LHD3. The size is remarkable and is absolutely amazing when seen in a place so unexpected, i.e. New York City. There is a lot to know about this wasp-class amphibious assault ship. You can read about it here.